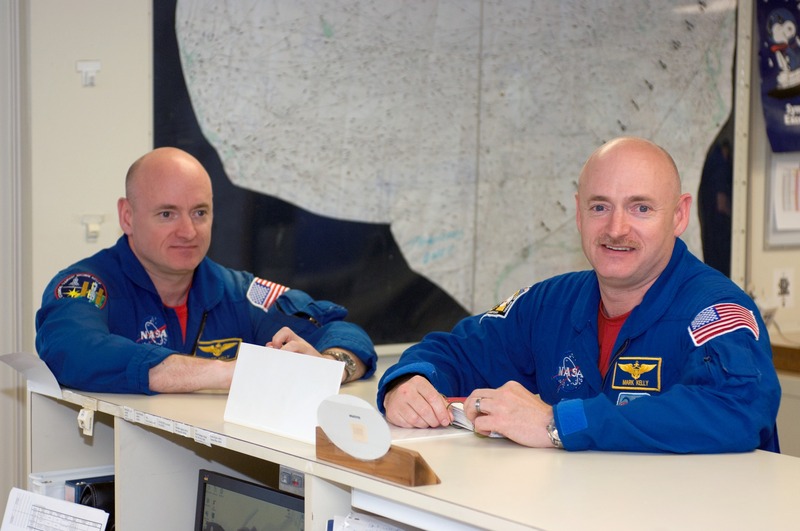 June 1, 2015 – Only one set of twins has ever been into space, and now those twins are providing an unprecedented opportunity for scientists to better understand the effects of spaceflight on the human body. Scott Kelly began a year-long mission on the International Space Station in March 2015, while his identical twin brother, retired astronaut Mark Kelly, remains on Earth as an experimental control. NASA selected ten separate investigations that will focus in part on the comparison of blood samples collected from Scott and Mark at regular intervals before, during and after the one-year mission. Physiological and psychological testing will also be conducted on the brothers to isolate any changes that can be attributed to life in space. 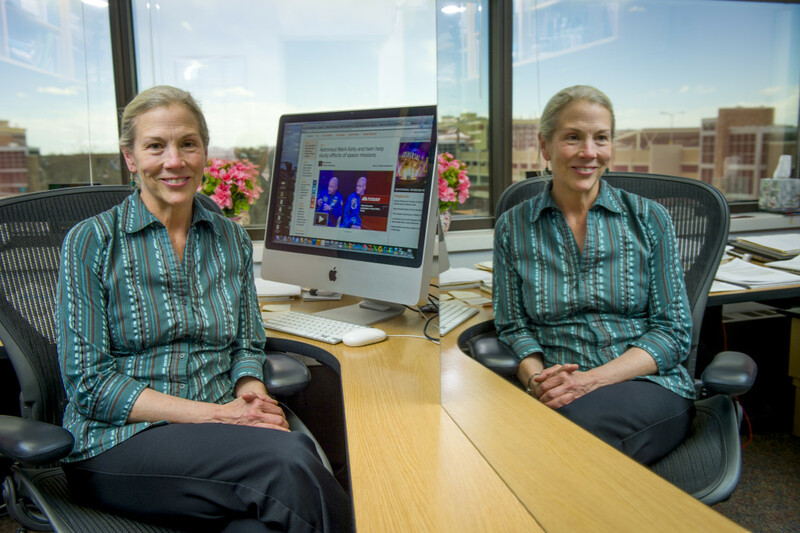 Colorado State University (CSU) researcher Susan Bailey is among the hand-picked scientists chosen by NASA’s Human Research Program to coordinate and share data and analysis from the investigation as part of an integrated research team. Bailey, an associate professor in CSU’s Department of Environmental and Radiological Health Sciences, is focusing on chromosomal features, called telomeres, which help protect the body from aging and the cancer-causing effects of radiation. Radiation exposure is a particular concern during space flight – and therefore of special interest to NASA – because astronauts are bombarded by subatomic particles from the sun and other sources. In the CSU project, the first study of its kind, Bailey will study the twins’ chromosomes in the blood samples. Each chromosome has a protective end-cap called a telomere, which Bailey compares to the plastic tip on a shoelace that keeps the lace from unraveling. As cells divide and replicate during the course of human life, the chromosomes divide as well, and the telomeres gradually erode, eventually leading to the natural death of cells. Bailey says the erosion rate of these end-caps reveals a lot about a person’s aging process and health. For instance, studies have shown that nonsmokers who get regular exercise often have longer telomeres than those who have unhealthy lifestyles. For the NASA project, Bailey gathered baseline data on the twins’ telomeres and is now examining how the various demands of life in space – like exposure to radiation, limited diet, and physical and psychological stress – affects those caps on Scott’s chromosomes. “Taking care of your telomeres is an important thing to do, and having a healthy lifestyle is a big part of that,” Bailey said, adding that previous studies have shown radiation can deteriorate the end caps in as little as five days. Bailey will also study the 50-year-old twins’ levels of telomerase, an enzyme that restores telomeres and extends the life of cells. The substance is not typically active in the body after birth, with a few exceptions – like in cancer cells, which have a competitive advantage over regular cells because telomerase gives them “immortal” status. Bailey says that while some researchers have studied the concept that activating telomerase in healthy cells could actually improve health and possibly extend life, it’s a double-edged sword because stimulating telomerase could also feed cancer cells. Clinical trials are being conducted with drugs that reduce telomerase levels as a cancer-fighting strategy. “The fact that telomerase gets turned off after birth is truly a tumor suppressor,” Bailey said. Bailey received her bachelor’s degree in biological sciences from CSU in 1980 and returned to campus 21 years later to study the effects of radiation on chromosomes with CSU professor Joel Bedford. NASA’s Human Research Program (HRP) is funding the 10 pioneering investigations into the molecular, physiological and psychological effects of spaceflight in a continuous effort to reduce the health impacts of human space exploration. The National Space Biomedical Research Institute is partnering with HRP to provide genetic counseling and assisting in the management of the research. The investigations, which were picked from a pool of 40 proposals, introduce to space physiology the field of -ornics, the integrated study of DNA, RNA, and the entire complement of biomolecules in the human body. Studying human physiology at this fundamental level will provide NASA and the broader spaceflight community with unique information. Investigating the subtle changes – or lack thereof – between the Kelly brothers at this level, after Scott’s year in space and Mark’s year on Earth, could shed light between the nature vs. nurture aspect of the effects of spaceflight on the human body. Although the investigations conducted on the Kelly brothers are not expected to provide definitive data about the effects of spaceflight on individuals – because there are only two subjects for data collection – they do serve as a demonstration project for future research initiatives. These investigations may identify changes to pursue in research of large astronaut populations. Bailey’s project, which netted $150,000 from NASA, is one of many in the CSU Department of Environmental and Radiological Health Sciences to attract funding for the study of radiation and cancer. A team led by Michael Well, a professor in the department, has long received NASA grant money to study the degree to which astronauts face elevated cancer risks from space radiation. Last month, CSU announced that it would establish a new research facility — the only one of its kind in the world — with a $9 million grant from NASA to help reveal the effects of long-term exposure to space radiation as the nation prepares for a manned mission to Mars. The multimillion-dollar grant from America’s space agency will provide a unique neutron radiation facility at CSU, which will mimic the long-term, low-dose-rate exposures to highly energetic radiation that astronauts would encounter on a multiyear mission to the Red Planet.